Alan Dawe’s book, The God Franchise, was a finalist in a New Zealand book competition, and he’s been busy marketing it ever since. Though new to self-publishing he’s already learned a lot – and shares some here. The God Franchise is literally a theory of everything. I have always believed that everything in existence must be able to be explained in a cohesive way, so the idea of writing such a book was very attractive. After an earlier stretch of writing in 2003, and a seven year break while I studied a number of healing modalities, I began again on a specific book in February 2010. After six months of work on the book, I realized that The God Franchise needed to be written first. So I started again, employing some of the previous material, and focusing on the overall foundation of the spiritual and life truths I had gleaned over the past 50 years. There were many parts of the book where I did not know where I was heading or what I needed to write, so reading what I had written became an interesting learning process for me too. Often, I would say to myself, “So that’s how it works!” I can honestly and humbly say that a lot of the work was inspired from beyond what I consciously was aware of before I started. The God Franchise is about God, the universe and why things are as they are. It is about you and me, and the purpose of our lives. It is about our Higher Selves and our Lesser Selves (The Ego). The book shines the light of a new perspective on the beliefs that we have carried from the past, and I have presented them in a way which aims to reconcile the major beliefs held around the world. At this point I honestly don’t know as the book is only a month old. Having said that, I have had an extremely positive response from personal sales, and from bookshops in Auckland (NZ) that have picked up the book. I feel that as people become aware of the book, they will buy it. There is something in it for everybody, and something really huge. 3. Your book did very well in a writing competition recently. Tell me more about that. Yes, the book was a finalist (4 out of 57 entries) in the Ashton Wylie Trust Unpublished Manuscript Award 2011. I had only completed it a few days before the deadline and it was proofread by a friend. I have since had it professionally proofread and copyedited, designed by a book designer, and have restructured Part One. The end result is stunning, and I will enter it in the Published Book part of the contest this year, with the intention of winning the top award! The Award is prestigious and is specifically in the Mind-Body-Spirit genre and offers one of the highest prizes in the country for a book award, $10,000. 4. You have not been traditionally published. Why? I was going down the traditional publishing track, but after attending a one-day seminar on self-publishing, I realized that my prejudices about self-publishing were easily resolved through modern Print on Demand (POD) technologies and the Internet for marketing. Add to that the current state of traditional publishing and a huge impatience I felt about getting this particular work out to the public, I immediately decided on 20 August 2011 to self-publish. In five months I had a top quality published book on the market. 5. You’re relatively new to self-publishing. How have you liked it so far? I am absolutely new to self-publishing. The first six months have been fun. I was very fortunate in immediately identifying a great book editor and a great book designer. This meant that the finished product was easy to produce professionally. My biggest challenge was getting permissions for all the quotes I had made in the book. I did get most of them, but I did have to call a halt at a certain stage. Fortunately, I could work around the missing (or very expensive) permissions, so that it did not matter. For printing I am using Lightning Source and they have solved all my requirements for production and distribution. All that is left for me to do is marketing, and the way I understand it, much of that would have been left to me anyway, even if I had gone the traditional route. 6. What sort of marketing techniques have you used to sell your books, and which ones have been most successful? It is early days so far. Firstly, it was important to get my book set up with all the major online bookshops and Google Books as soon as possible. I have now done this, and feel it is important to get some reviews there too. I am a little mystified on how to get hordes of visitors to the online bookshops, and get them to at least take a look at the book. That is my main challenge and one I am beginning to face now. It is too early for me to evaluate what I have done or to discontinue any particular marketing techniques. What I realized is that it is vital for me to put my efforts into aspects of marketing that offer the best exposure. Obvious, but challenging. Getting early readers for my manuscript and listening to every detail of their comments was vital for bringing the book to a high standard. Since I am the final judge on everything with regard to the book, there is no space for ego or stubbornness. Also, getting permission to use quotes is very time-consuming and needs to be started very early on. 9. If you could do one thing differently in publishing your book, what would it be? Make fewer quotes, and start getting permissions for the ones I need much earlier. A bit early for me to give advice, but it seems to me that the key is to reach the greater public on the Internet. That is my next major challenge. Any idea for marketing that presents itself, jot it down. You will need all the ideas you can muster! Marketing, marketing, marketing. However, I am also planning to work on my second and third books as soon as the marketing plan starts to get some traction. My second book is likely to be called Significant Things. This is the book I interrupted when I realized a book called The God Franchise had to be written and published first. The third book will be about interpersonal relationships within the context of The God Franchise. 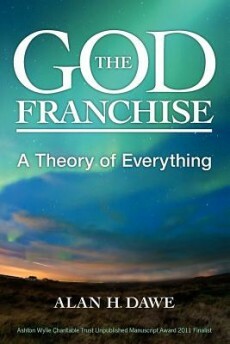 My brand is The God Franchise and further books will be supported by that original platform and will integrate with it. However, in terms of a tagline, if that is what you are asking, I have not gotten there yet. My website is publishing.lifemagic.co.nz and my blog is at TheGodFranchise.com. Both Google Books and Amazon.com have a Search Inside the Book tool, so this is also a great resource for learning more about The God Franchise. Thank you, Kris, for this interview and the opportunity to profile my book – it is now in the readers’ hands.